Like that guy who pushes a cart by your window every evening selling baked sweet potatoes (don't pretend you don't know what we're talking about), Activision's Xbox Live sale is ready to move some merchandise. The list of games is dominated by licensed releases, including about half a dozen Spider-Man titles, a couple of Transformers games, and one or two X-Men releases. For half off it's not a bad deal. But enough of that. Let's talk co-op! All of the titles below are 50% off and have a co-op mode of some form. Check the links for more info. • Arkadian Warriors - Diablo. With a gamepad. With a friend! • Assault Heroes - A twin stick shooter where you take on the role of the only surviving member of an elite special forces unit searching for a secret underground lab. • Assault Heroes 2 - A sequel to the above. Oh, and look! An Assault Heroes 2 co-op review! 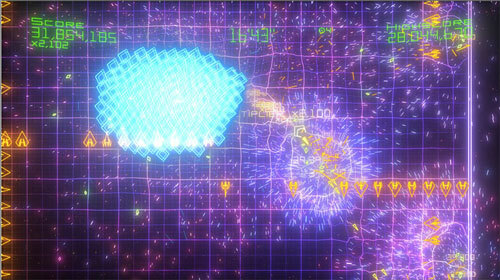 • Geometry Wars: Retro Evolved 2 - The super-intense shooter in glorious 1080p. • Transformers: War For Cybertron - Actual co-op for a Transformers game. Even comes with our special no-cost co-op review! And that's the way it is. Until October 7th, at least, when the sale ends. Page created in 1.8538 seconds.